I am writing this in a hotel room in Subic Bay, the Phillipines. Duncan (ALIVE’s skipper) has just left to go down to the boat yard to do his daily check/giddy up on the painting progress. 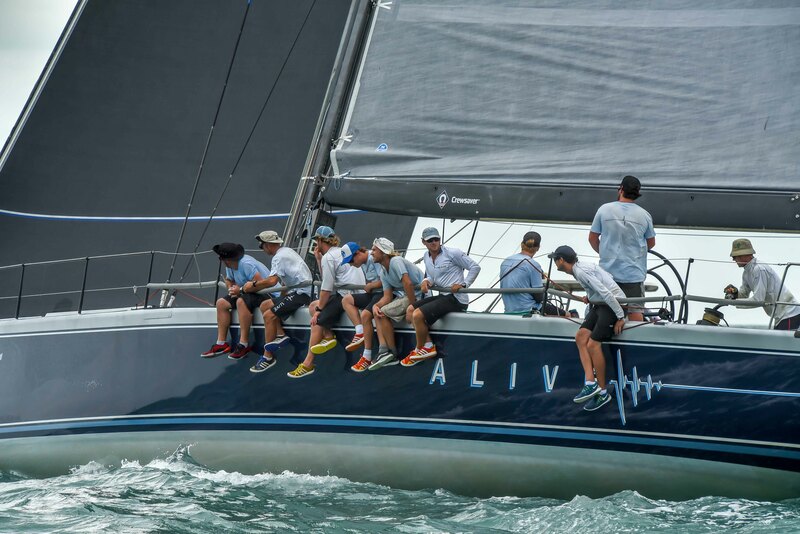 ALIVE’s dark blue top sides are getting loving attention from a team of about 20 diligent but now heavily sunburnt Phillipino painters who are sanding and filling the myriad of small dings and scuffs from 9 months of intense and amazing sailing in Asia. There is a bit of pressure on because delays with slings and weather and ‘tropical time’ have pushed back the final top coating, but we are pushing to get it all done as soon as possible. Why the urgency? Because we are coming back specifically in time for the Brisbane to Keppel 2016 and we want ALIVE to look her shiniest bluest best for the event!! I will fill you in with what ALIVE has been up to and what is means to ‘do the Asia series’ in a mini-maxi and come out smiling at the other end! Now is my chance to say it, and I cannot say it enough: Thanks to Phil Turner for this wonderful boat and wonderful sailing program. The past 9 months in Asia with ALIVE has been fantastic, amazing, beyond expectations, just plain great fun. Hardwork too, but that is part of the deal with boats and sailing goes, it does not get any better than this. We first suggested the concept of coming to Asia to Phil in 2014, at that stage “just a thought” to see “maybe we could do something called the Asian Series” and “what do you think?”. Even though it was a case of the blind leading the blind, Phil liked the idea, so in September after the Brisbane to Keppel 2015 we found ourselves in Hong Kong with a boat on a container ship and a lot of unknowns. Fortunately, Kevin Costin, a well known RQYS personality and experience Asia compaigner, was able help with some of those questions, including putting us in touch with Neil Pryde’s ex-boat captain Lyndon Robeso, who became ALIVE’s maintenance captain for the next 8 months. The first race (October) was the slightly scary 650Nm Hong Kong to Vietnam race in the reliably 25+knots NE trades. 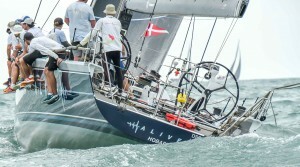 5 miles with a headsail up to get out of Hong Kong, and then 645Nm under spinnaker makes this race a true sleigh ride. 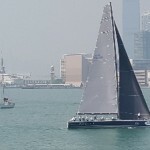 The race is made even more exciting by the 1st world glitzy glamour of Hong Kong Harbour, which contrasts starkly with the ‘ex-Soviet block beach destination cross post-apocalyptic theme park’ that is the Vietnamese beach city of Nha Trang. To top it off we were given red carpet treatment unlike anything I have seen for a sailing event, with Vietnamese celebrities, catwalk models, fashion shows, and roof top party 5 star service in a city where people are employed to cut the grass…..with scissors. 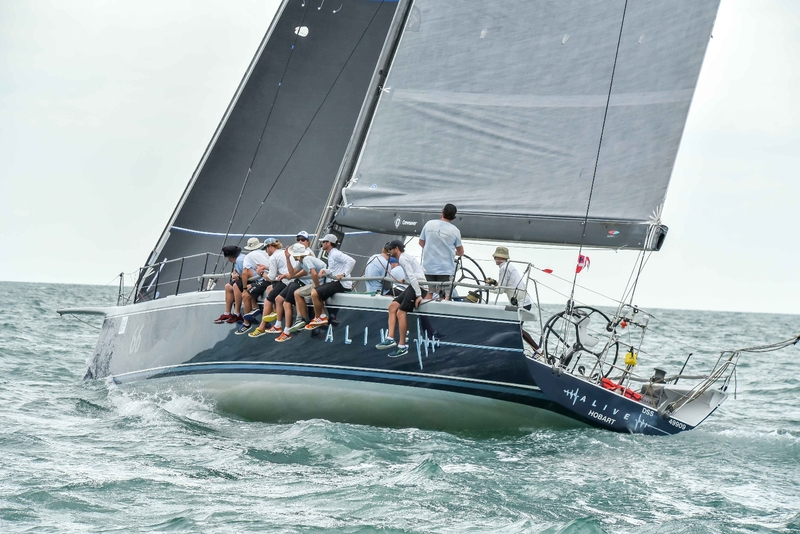 Duncan and Lyndon then sailed the boat 1500Nm via Singapore to Kuala Lumpur for the start of Raja Muda Selangor International regatta (November), which is a series of short day races up the coast mixed with inshore windward/leewards. This race is a difficult one for the big boats because they tend to finish the day races before the sea breeze builds fully, giving smaller boats the advantage. Nevertheless it is one of the most memorable regattas for me because of the amazing culture and scenery at each of the stopping points. Starting in Port Klang (which has to be seen to be believed), the race stops at tropical islands, then Penang, and finally finishes at the World Heritage Area Langkawi. My favourite memory is the death defying dragon dance at the fully catered dinner at a beautiful ancient Chinese temple in Penang. Little Max thought the dragon was great! For December we took ALIVE to the Kings Cup regatta in Phuket. This is a beautiful part of Thailand (and the average Australia tourist clearly agrees), and the breeze is OK too for the regatta which gets a good number of TP52’s and also a couple of other big boats. Racing is run off the white sandy beach and the boats anchor overnight, so Lyndon and crew would spend each night on the boat on anchor watch. After racing the windward leewards each day, ALIVE’s crew would retire to their roof top marble lined pool to sip $5dollar cocktails and $1beers looking into the azure blue sea and watching the sun set. No exaggeration necessary. Furthermore, each of the resorts in Phuket competes to put on the most outstanding party, so each award ceremony (where we got a few first places I might add) was more amazing than the last! 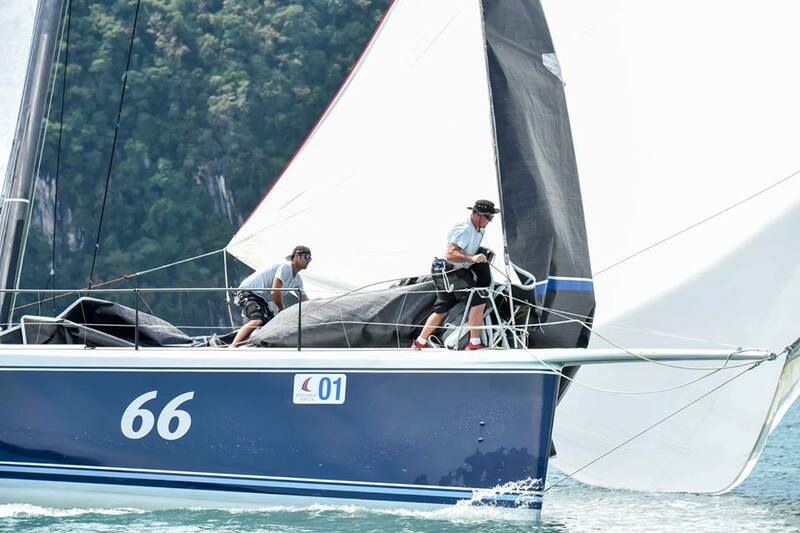 Phil had so much fun at the other races, that he decided we could not miss the Royal Langkawi International Regatta in January. We had originally left that one out of the racing program simply because we were worried about reaching ‘crew burnout’ point. ALIVE runs with 14 sailors, of which about 70% are amateurs. One reason we choose amateur sailors is their enthusiasm for the boat and the program, however coming to Asia for 5-10 days every month is difficult for guys with full time jobs and families, so for the past 4 regattas we had been cycling through new faces at a high rate and nearly everybody had run out of either holidays or family good will. Nevertheless we scratched together a team of 12 with a few days to go and entered the race. Lucky for us, because it proved to be another great regatta and we won outright, something which is difficult to do at the best of times against hot TP52s, and even more difficult when the racing is only windward/leewards. February Duncan took ALIVE the long way back to Hong Kong via the Phillipines, thus somewhat avoiding the same set of boisterous never-ending northeast Trade Winds which make the Hong Kong to Vietnam Race so much fun. 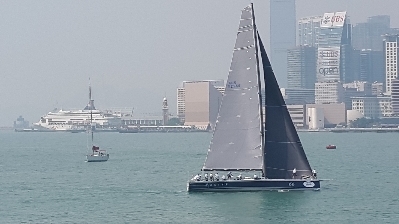 The Rolex China Sea race is run once every two years, and is the Asian equivalent to the Sydney to Hobart. The race offers a mixture of conditions, from light up wind to heavy down wind, and this year was no exception. Many of the smaller boats reported solid 40knots and gusts up to 50knots. ALIVE was lucky in that we were fast enough to stay on the leading edge of the worse weather. Our arch rival for Line Honours was the patently faster 60ft racing cataraman Mach 2. Mach 2 had a 40 Nm lead on ALIVE approaching the Philippine’s coast only 70 Nm from the finish, but they decided to follow the breeze and go north of the rhumb line close to the coast. Luckily for us Lyndon, our Phillipino maintenance manager (and 15x Rolex China Sea race veteran), had briefed Duncan and anyone else who would listen prior to the race to stay south and LONG way south otherwise risk getting stuck in the dreaded ‘Luzon hole’. So stay south we did, even though the wind models said to go north, and we caught up the 40Nm to finish 36Nm ahead. 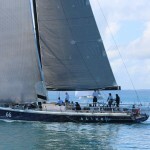 ALIVE broke the 16 year race record and won line honours as well as IRC 0. So that brings me back to the present, sitting in a hotel with the baby sleeping and writing emails to everyone to let them know that we are, really truly, coming home. Duncan and I have loved our time in Asia with ALIVE and the great bunch of guys who sail on her, and we hope that Phil gives us a chance to come here again. Right now, however, we want the comfort of sailing in ‘home waters’ in preparation for the daunting Sydney to Hobart. The Brisbane to Keppel represents many things to us and personally it is one of my favourites. 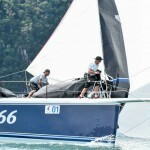 Firstly, it is very important of offshore training in preparation for the Sydney to Hobart. 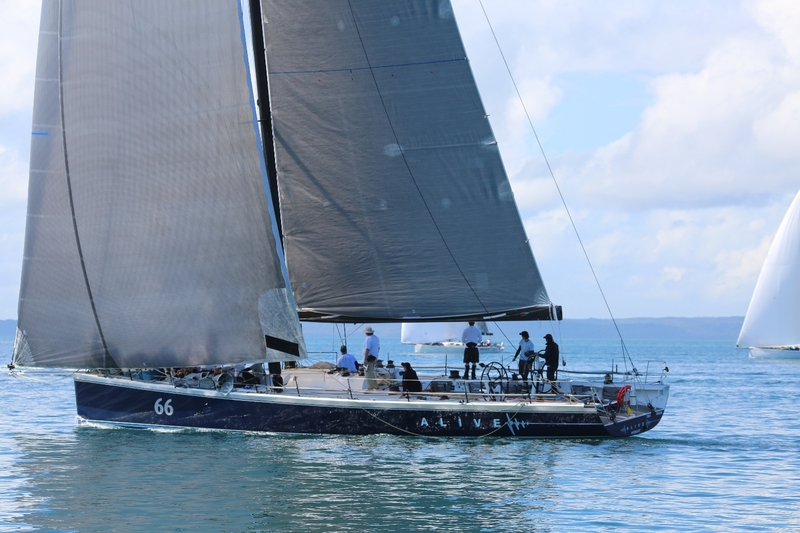 Secondly, it is a logistically relatively easy – entry, timing of the race just prior to Airlie, close to home – all these things combine to mean there is less headache involved to get a boat like ALIVE to start. Thirdly, the race is quite technically interesting (and scenic) with the start up the channel in Moreton Bay, the passage past Fraser Island, Indian Head and Lady Elliot while weighing tide, current, sea breeze and land breeze against point of sail and dodging whales. Finally, the finish at Keppel Bay Marina is usually, for us, very early in the morning. However it is warm and the committee have showers, food and drinks all waiting which quickly lessens the fatigue and makes for a good banter on the way home and/or late afternoon sleeps for all those who are staying around. PS: The container ship is booked for late May from Hong Kong (fingers crossed no damage to the new paintwork) and we will get her home to her hard stand at Rivergate marina late June. ……time to get on with some real work. Trackers are terrible things – once upon a time I would have been able to wave goodbye and then get stuff done until a phone call let me know who finished/where/when. Now it is a case of ‘tracker dependency’. Where are they up to? What speed/current/weather? What positions on the leaderboard? Mood can be directly correlated with standing on the leaderboard: High = good, low = really grumpy and ‘arm chair tactics’ by the tonne. That reminds me……better apologise to that friend who inncocently called to ask how the boat was going while we were not going doing so well….. The team arrived in Gladstone about 11pm to be greeted by race director Herb Pendergast (nice touch). From a purely selfish perspective, I am pleasses to repor tthat the tired (but well fed) guys not only finished the race, but also still did a full debrief, packed the boat, loaded the race sails in the trailer, put the delivery sails on the boat, worked out the full jobs list needed to be done by next time, and then hit the bar with the Black Jack guys. I hear it was a bit messy – ah to be young enough again to back up 48 hours of racing with a long session at the pub. I should mention that Herb was a lot of help to me during the race registration process, especially with getting the considerable documentation required in order. Thanks also to Gen White from Marine Safety, Mark, Duncan, and Peter Talbot. What next? Well there is always the jobs list…….An even bigger one this time to get ready for the Melbourne to Vanuatu race at the end of June. First delivery, first race, first bar crossing, first night at the bar, and, finally, first place! It was a pretty rocky and rolly weekend overall – both emotionally and physically. The biggest challenge I suppose is building the crew. We have had a few training weekends prior to this regatta (which we approached as just another training weekend), but finding a group of sailors who can dedicate the necessary time, who have the necessary skills, and get along with us and each other is more of an art than a science. And like all art – the critics and fans are always happy to add their 2 cents. So…..to successfully rip that 66foot boat around 1 Nautical Mile windward leewards in Sail Paradise so early in the program was surprising and gratifying. To win? Out standing. I still look forward to the remainder of this year with considerable trepidation. We have a long way to go before we can claim any mastery over this thoroughbred yacht. She is very highly powered, narrow, tender, and very much reliant upon her crew to tend to her every need. A training run in solid 25 knots breeze a few weeks go brought this fact home for me: Two sail reaching down the Brisbane River Channels had us at a consistent 22knots. The same conditions but offshore with a spinnaker and big swell leaves no room for errors.